What delivery charges can I expect? We offer FREE delivery on all orders over £100. If we receive your order before 12 midday we will dispatch your tiles next day Monday-Thursday (subject to stock). Delivery is charged at £8.00 for a standard order. All transactions are processed securely via Sage Pay. Cards accepted are MasterCard,Visa,Visa Elctron,Maestro. We also accept Paypal payments. All transaction data is protected under Sage Pay licensing. Once your order has been placed your goods will be picked and run through quality control. Once cleared they will be eligible for dispatch. You will automatically receive a receipt of purchase after placing your order. You can check and edit all personal information about your order and delivery details within My Account. Here you will find all invoices. Once your order has been dispatched it cannot be cancelled. If you cancel your order it can be returned, however this will incur a 25% handling charge. Once our transport company has collected your goods from our warehouse if you wish to cancel your order, you would be liable for transportation return charges. If you have completed your tiling or flooring job and wish to return any resalable goods we will provide you with a refund. Please note that only full boxes of tiles will be refunded. Simply return the items within 28 days of receipt of goods in their original condition. The English Tile Company reserve the right not to refund if the goods are deemed as not being in a resalable condition. Any delivery charge will not be refunded. Refunds will only be processed once the goods have arrived with us and we have inspected their condition and deemed them to be in suitable condition for resale. Any delivery charge from the original order will not be refunded. Please note once a refund is processed it may take up to 30 days for the funds to appear back on your card, this is dependent on the card provider and is not under the influence of The English Tile Company. Acceptance of these terms and conditions at the point of purchase represents acceptance of refund period of up to 30 days. All goods must be checked by the customer on receipt of goods – this is imperative. No responsibility for damaged product, shortages or incorrect products can be accepted after 48 hours / two working days (Mon – Fri) of receipt of goods. The English Tile Company products are guaranteed for 12 months from point of purchase (excluding individual supplier guarantees, details of which would have arrived with your product). Compensation, refunds or returns will not be considered after this period. If you find any damages on receipt of goods, you must forward a clear photo of the damages to enquiries@english-tiles.co.uk before we send out replacements. Can Mosaic Tiles Be Used In Showers? Absolutely! Mosaic tiles are perfect to use in showers and can actually eliminate the use of water proof paint. Take a look at our guide here on the perfect mosaic tile materials to use in the shower. Can Mosaic Tiles Be Used On Floors? Absolutely, Mosaic tiles have many benefits when introduced to the floor. Why not take a look at our guide on the official benefits of using mosaic tiles on the floor! Are You Able To Cut Mosaic Tiles? Yes! You can even cut glass and stone mosaic tiles, take a look at our guide on the process of cutting mosaic tiles! When To Grout Mosaic Tiles? Before proceeding to grout mosaic tiles, the surface must be dry, level and clean. Why not take a look at our guide on when is the best time to grout mosaic tiles for more information? Are Mosaic Tiles Heat Resistant & Easy To Clean? Mosaic tiles are extremely heat resistant and you can use them in both your kitchen and bathroom – they are also very easy to clean but shouldn’t be cleaned using harsh chemicals. View our guide today on our full heat resistant and cleaning guide. Can You Glue Mosaic Tiles To Glass? Absolutely! However, you must choose the right glue or adhesive accordingly, take a look at our gluing mosaic tiles guide today for more information. What Are Glass Mosaic Tiles? 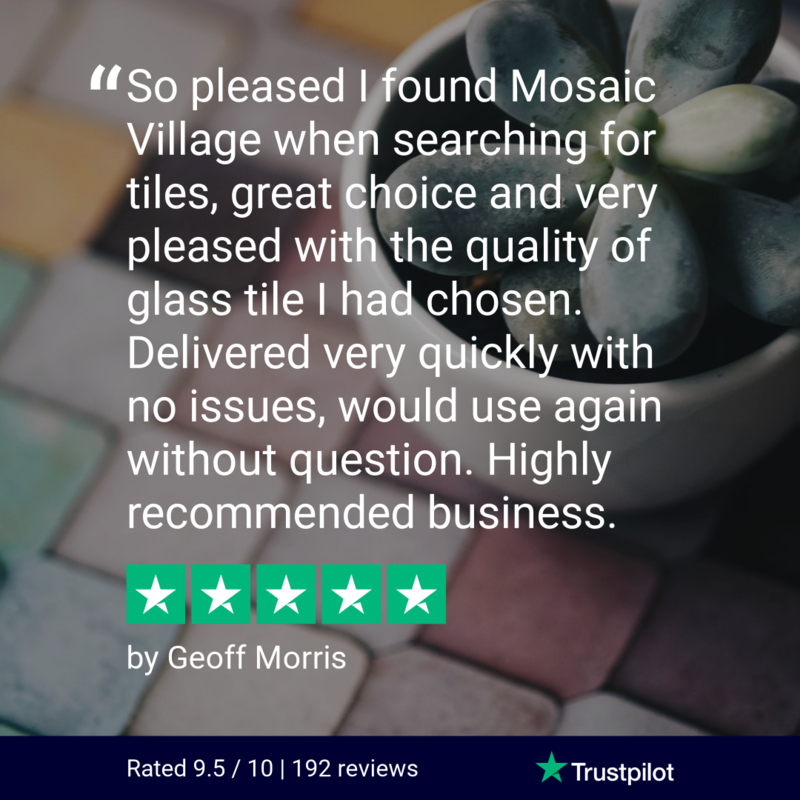 Glass mosaic tiles often contain a number of different smaller pieces of differently coloured glass, for more information check out our glass mosaic guide and their benefits today. Can I Put Mosaic Tiles On Drywall? Yes, you can glue mosaic tiles on existing drywalls, take a look at our guide today on why there is a misconception about gluing mosaic tiles on drywall. How Long Do You Leave Mosaic Tiles Before Grouting? Here at Mosaic Village, we recommend leaving 24-48 hours to set. Why not take a look at our guide today on how long you should leave mosaic tiles before grouting for more information. What Are Mosaic Tiles Made Of? Mosaic tiles can be made out of a variety of different materials, such as glass, brick and metal. Why not take a look at our guide today on what mosaic tiles are made of. Are Mosaic Tiles Easy To Fit? Mosaic tiles are extremely easy to fit! Whether you are a DIY expert or an aspiring home interior designer, anyone can fit mosaic tiles with the right tools! Take a look at our guide on whether mosaic tiles are easy to fit today. Can Mosaic Tiles Be Painted? In theory you can paint mosaic tiles, however it always depends on the surface and finish of the tiles. Why not take a look at our guide today on whether mosaic tiles can be painted. Can You Reuse Mosaic Tiles? Often mosaic tiles still look in perfect condition when removed, however reusing them could practically be a nightmare for you. Take a look at our guide today on whether mosaic tiles can be reused. Mosaic tiles are going to be frequently exposed to high temperatures, therefore we ensure all of our tiles are heatproof. Take a look at our guide today on are mosaic tiles heatproof for more information. Why Are Some Mosaic Tile Colours More Expensive Than Others? Some mosaic tile colours can be more expensive than others and this can be down to a few reason, one being the quality, or the materials used. Why not take a look at our guide today on why are some mosaic tile colours more expensive than others. What Is The Best Colour Grout To Use With Mosaic Tiles? White and black are the most popular colour grout to use when it comes to mosaic tiles, however it all depends on the colour of your tiles. Take a look at our guide today on what is the best colour grout to use with mosaic tiles. Can I Mix Glass & Ceramic Tiles? Yes! glass and ceramic tiles look incredible together so why not mix them. If you are unsure and need a little bit more information, click on the link to view our guide on whether you can mix glass and ceramic tiles. Are Mosaic Tiles Safe For Outdoor Use? Mosaic tiles aren’t just for indoor use but ourdoor use too! Take a look at our guide today on whether mosaic tiles are safe for outdoor use. Do Glass Mosaic Tiles Need To Be Sealed? There is usually no need to seal them, however, take a look at our guide on do glass mosaic tiles need to be sealed for more information.